If you are new to keeping fish and you are looking for a starter tank, a 15 gallon tank is a great size to begin with. 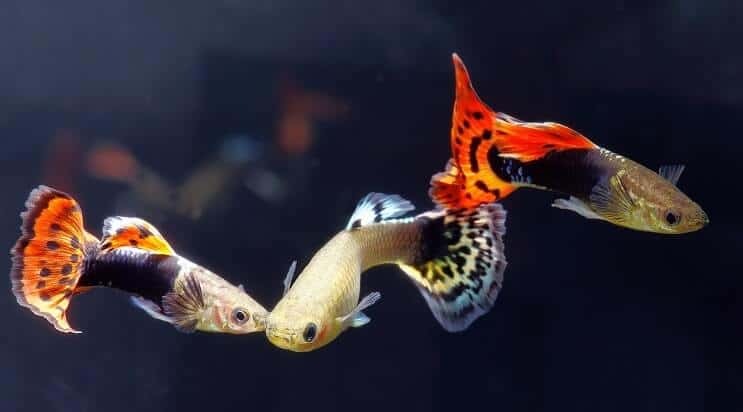 It allows you to keep a small selection of fish and really begin to understand water chemistry, and what is required to care for aquatic creatures, before you move on to bigger tanks. Not only is a tank of this size ideal for beginners, but it can also be used by more advanced aquarists for breeding or biotope tanks. In this guide below we review the best tanks available, give you fun stocking ideas, and finally, explain the best equipment to keep your fish healthy. Right in the middle of a 10 gallon and a 20 gallon aquarium, a 15 gallon tank is still considered a small aquarium. Most beginner setups at local store are 10 gallons, however a 15 gallon is actually better for beginners. That extra space gives you more tolerance with the water chemistry. In fact, most beginners don’t realize that the larger the tank, the easier it is to keep the water in the tank stable. This tank is also perfect for more experienced aquarists who are looking for a small tank which can be used in emergencies as a hospital tank for sick fish, or as a quarantine tank for new fish before adding them to the existing setup. It also makes the perfect size for a breeding setup for fish keepings who are taking their hobby to the next level. These tanks come in a range of different shapes and sizes, some are thin and long, others are short and tall. The best tanks for most fish that would live in a 15 gallon fish tank are those that have the largest footprint. Due to the size of these tanks, they are perfect for small spaces in your home or office. 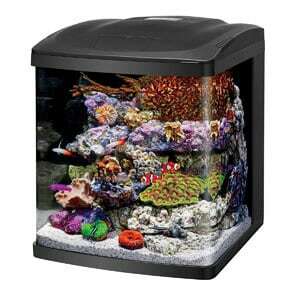 A standard 15 gallon aquarium tank is 24 x 12 x 12 inches. However, they come in lots of different shapes and sizes depending on what you’re looking for. 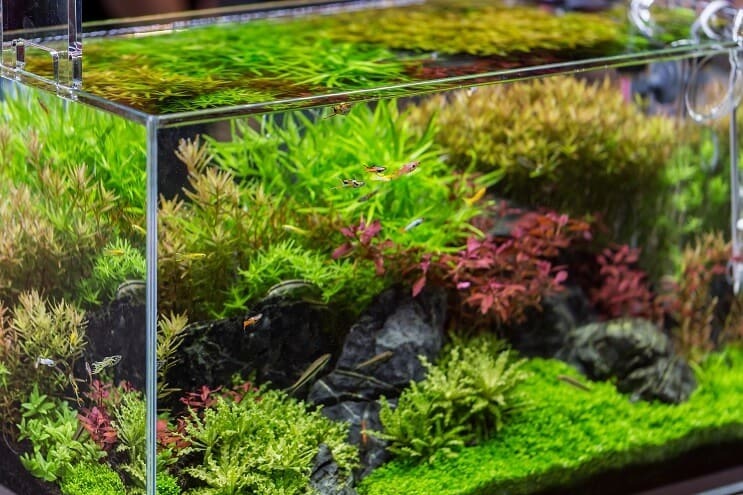 You could choose a high 15 gallon aquarium, which are usually 20 x 10 x 18 inches. Whilst empty these tanks weigh around 20lbs, compared to 170lbs when full. This stylish kit comes with almost everything you need to start your own aquarium, perfect for either the beginner or experienced aquarist. This stylish aquarium has a distinctive curved front which allows you to see all your plants and fish with ease. With a black trim around the edges, base and top, it will fit in well in any modern home. It comes with an LED lamp, which is great for promoting the growth of a wide range of plants, and will also enhance the color of your fish. The LED lights can be controlled using a remote control, and can be set to different colors, as well as a few fun effects such as faded cloud, and lightening. This kit also comes with a powerful filtration system which will deal with all the tanks biological, chemical and mechanical filtration needs. Aquarium Dimensions: 16(W) x 15(D) x 15(H) inches. Plenty of room in the back section to add your own heater. 15 different light settings, with a dimmer switch to replicate their natural setting. Stylish and sleek design with the bowed front. The filtration system is excellent. Black background which doesn’t suit all fish. The slits in the intake vent are quite large so small fish could slip through. It’s not easy to change the lights if you want to add different ones. The hood has a flimsy feel to it. If you’re looking for a tank which is out of the ordinary, this hexagonally shaped aquarium is perfect for you. This uniquely shaped tank is sure to be the focal point of wherever you place it. With a hexagonal design, you can see your fish from many different angles. It comes with a reflector and a 12 inch light fixture. This tank is also made from acrylic which is both stronger and lighter than an equivalent glass tank. It is also less prone to chipping and cracking – perfect for houses with children and other pets. 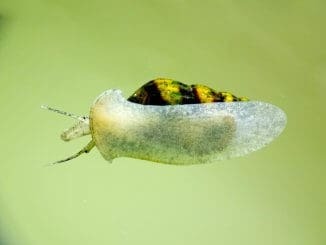 SeaClear have a great reputation within the aquarium industry and offer one of the more extensive warranties to match the quality of their products. Aquarium Dimensions: 15(W) x 15(D) x 20(H) inches. This tank has rounded corners which is a great safety feature. There are three background options which you choose when you purchase. You can add your own filter and heater. Acrylic is stronger and lighter than glass, making it safer for kids. It’s not easy to feed the fish (the main opening is quite small). No removable lid, which makes it tricky to clean. It only includes a lighting fixture, not the actual bulb. Slightly bigger than 15 gallons, this 16 gallon tank is stylish and fits in well in any modern home. Actually slightly larger than the other tanks we’ve featured here, this 16 gallon tank comes with LED lighting, filtration and a pump. The integrated lighting is on a 24 hour timer and can be set to one of three different settings: bright white, sparkling blue and color enhancing. The lighting also has a 30 minute sunrise and sunset function and a 60 minute moonrise and moonset function which perfectly replicates the fish’s natural environment. 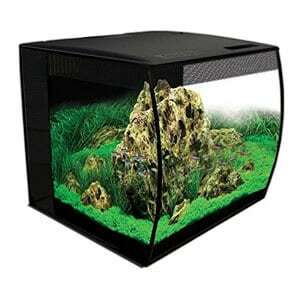 It has a compact and customizable filtration system, built in to the back of the tank. It also has a submersible pump with dual intakes and an adjustable return nozzle. Aquarium Dimensions: 15 x 16.8 x 17.5 inches. It is a top quality and well-made tank. 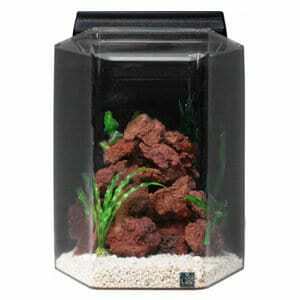 This tank is very easy to set up and the instructions are comprehensive. The rear of the tank has three chambers for equipment. A very stylish and good looking tank. The LEDS are only useful for plants that don’t need high intensity light. It is tricky to clean in some areas. The fan inside the lid is loud. Whether you decide to have a cold water, or a freshwater tank, all of them need the same basic equipment: a filter and lights are a must. 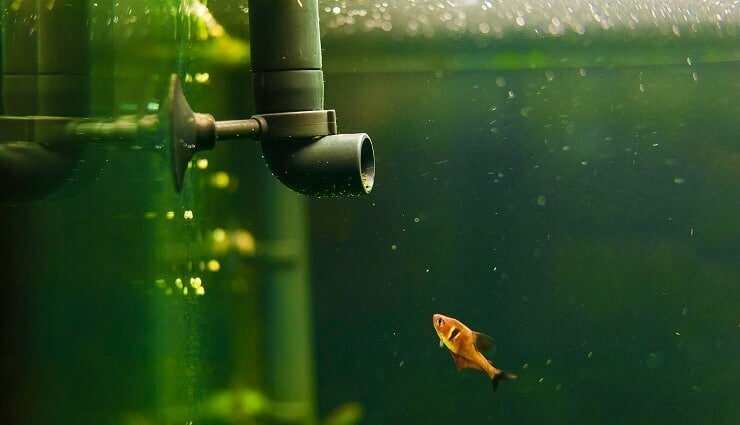 A filter should be used in every fish tank to help keep the water clean. Mechanical filtration (to remove the larger particles of waste). Biological filtration (to convert the ammonia and nitrites into nitrates). Chemical filtration (to remove organic pollutants which can’t be removed through biological or mechanical filtration). There are plenty of filters to choose from, but the most common type to use in a 15 gallon tank is a hang on back filter. The vast majority of freshwater fish and plants need regular light. To replicate natural daylight, artificial lighting is used in fish tanks. Artificial lighting provides the living things in your tank with the right amount of light – this is crucial for raising healthy fish. There are many different types of lights available for your tank, from LED strip lighting, to incandescent bulbs. The type you choose will depend on the plants and fish you keep. A good all-rounder is LED lighting, most modern lights are full spectrum providing your inhabitants with the most natural light possible. 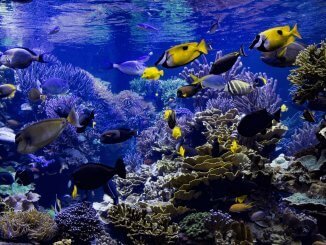 By installing a heater in your fish tank, you are given the option of adding a much larger variety of fish to the tank. This is because there are lots more tropical fish available than there are cold water species. There are plenty of varieties of heaters on the market, from fully submersible heaters to in-line heaters to substrate heaters. The most popular type of heater is the fully submersible one – these come with either a pre-set temperature, or a dial so you can change the temperature when needed. You can read our guide on aquarium heaters here. The options are endless when it comes to setting up your tank. We’ve listed a few of the most common combinations below to help you decide how to setup your tank. What Fish Can You Keep In A 15 Gallon Fish Tank? A 15 gallon fish tank would be ideal for a group of schooling fish. 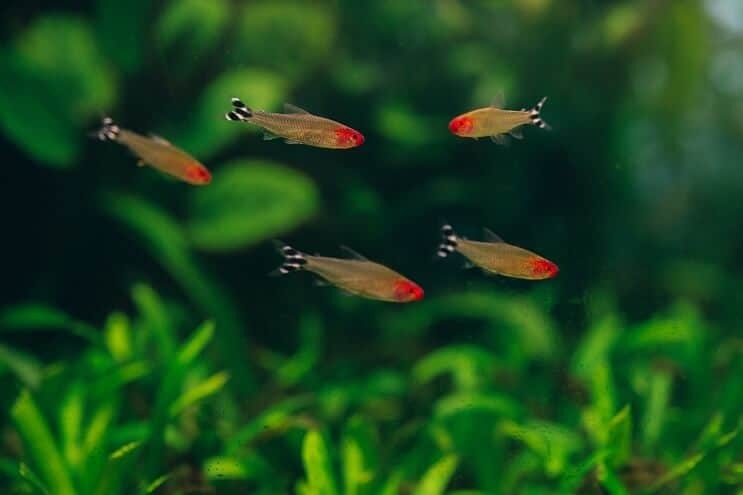 When you choose your fish, you need to make sure that they all require the same water conditions, and that they are compatible with each other. As long as you choose peaceful, small (1-2 inches) fish, they should be ideal for your 15 gallon setup. Avoid any fish which will grow any bigger than 2 inches, and avoid fish that have aggressive or territorial behavior (unless you’re keeping them alone in the tank). With this set up, you can also keep some popular freshwater plants such as Hornwort, Anacharis, or Java Fern. 15 gallons is the ideal size to setup a miniature biotope tank based on a particular region or body of water. 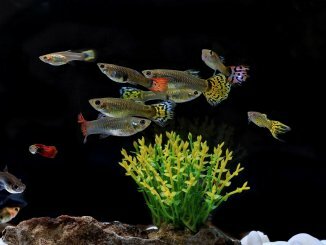 Many experienced aquarists enjoy researching the particular area to find out which fish are native, and which species of plants they live amongst. They then attempt to replicate the natural environment as closely as possible. For example you could base your tank on a South American river and include a small school of Harlequin Rasboras. Depending on the species you choose to breed, you will need to set the tank up to ensure they are comfortable, and that you can access the eggs and the parents easily if you need to. Most breeding tanks for egg-laying fish are usually quite bare, using just a filter and a heater. They don’t tend to have any plants or gravel because the eggs can get caught and are difficult to remove. However some fish require plants to breed and build their nests, such as Bettas. Setting up your fish tank is easy once you know how to do it. First you need to decide where it will stay (once you add water it becomes very difficult to lift). Make sure the place you have chosen is level, away from any direct sunlight and away from heat sources. Next, wipe your tank with a new cloth and warm water to remove any dust (it’s important to not use any old-equipment incase old chemicals get into the water). You can now lay 2 inches of substrate on the base of the tank. Add the equipment to the aquarium, including the filter, heater, lights and thermometer, but don’t turn them on just yet. Fill the tank 2/3 of the way up with water, and then position your plants and decorations. You can then fill the tank up to the fill line and add a de-chlorinator to make the tap water safe for your fish. Once the tank is full, you can switch the equipment on and leave the tank to cycle for 4-6 weeks. Use a testing kit to test the pH, ammonia, nitrites and nitrates throughout the cycling period. Your tank will be ready once you’ve seen the ammonia and nitrates spike and settle back down to 0ppm; nitrates should be less than 10ppm. Most people skip the cycling stage but this is essential if you want to provide your fish with a healthy and long life. Choosing a 15 gallon tank, gives you all the same options that you have with a 10 gallon tank, but gives you that little bit of extra space. If you’re looking for a complete setup, then the Fluval flex kit is ideal for you. If you want something that will turn heads and is slightly different, choose the hexagonal shaped aquarium. Whichever one you choose, enjoy setting it up and caring for your fish for many years to come!